A trip to Australia is not complete without a visit to the country’s spiritual heart, Uluru. Here is how to have the ultimate experience. Also known as Ayers Rock, this majestic landmark is awash with ancient culture, history and breathtaking surrounds. There is no shortage of memorable experiences, yet you can soak up the magic in as few as three days. Here’s how. Artist Bruce Munro has installed more than 50,000 bulbs to create the magical Filed of Light experience at Uluru. 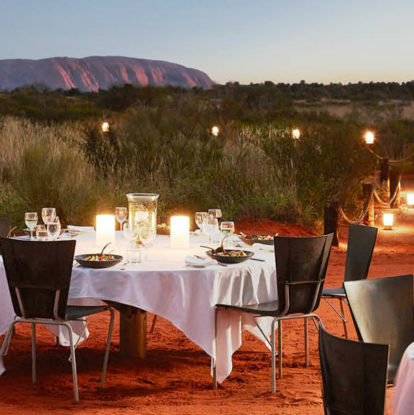 The world-class Ayers Rock Resort caters to all needs and tastes with five accommodation options. Sails in the Desert is the resort’s premium stay, combining luxury, style and comfort. This evening the exclusive experience ‘A Night at Field of Light’ is on the program. This exquisite affair combines a special dinner set under the outback sky with the jaw-dropping Field of Light installation. Running until the end of 2020, the not-to-be-missed exhibition features 50,000 solar-powered spheres that come to life as night falls. Begin the day with an inspiring and intimate sunrise on the renowned Desert Awakenings Sunrise & Uluru Tour. Feast on a traditional bushman’s breakfast as you watch the desert palette unfold. For lunch choose from one of the resort’s 11 restaurants, each featuring dishes using native Australian ingredients. Culture is on the cards in the afternoon thanks to the free daily Indigenous guest activities or the popular Dot Painting Workshops, where you will learn about the traditional artform before creating your own masterpiece. Uluru is the heart of Australia, both spiritually and geographically. Take to the skies with a helicopter flight over Uluru and Kata Tjuta, the 36-domed formation as impressive as the region’s namesake. The bird’s eye view is the ideal way to absorb the vast landscape. Before you depart, pick up a souvenir at one of the resort’s art galleries or shops – a tangible piece of this spiritual adventure to take home. For more information, please visit ayersrockresort.com.au, call + 61 2 8296 8010 or follow on Facebook and Instagram.